It’s always good to take some time off, step back, and refresh. During our short leave, we received inquiries on when our next blog post would be released. Your feedback and demand for our work are appreciated. The idea that we’re providing valuable information is motivating. Our break is over and we’re back with some more market insights you might find useful. Today’s update involves a major industrial sector that has been underperforming for a long time: Energy. For over 9 years, the Energy sector has underperformed the broad market. Don’t believe us? Take a look. Above is a weekly chart of Energy (using ETF, XLE) versus the S&P 500 (using ETF, SPY). Simply put, when the ratio rises, XLE is outperforming. When the ratio falls, SPY is outperforming. Since mid-2008, Energy has been nothing but a hot mess. From June 2008 through today, if you were involved in Energy, you lost 7% of your capital while the broad market represented by the S&P 500 appreciated 114%. Talk about opportunity cost. Within this 9-year period, however, there have been countertrend moves worth participating in. For example, Energy outperformed the S&P 500 +29% versus +12% in calendar year 2016. Not too shabby. But as the chart above highlights, the bigger trend is down. So what we’re shedding light on here today is NOT an opportunity with the winds of a larger trend at its back. 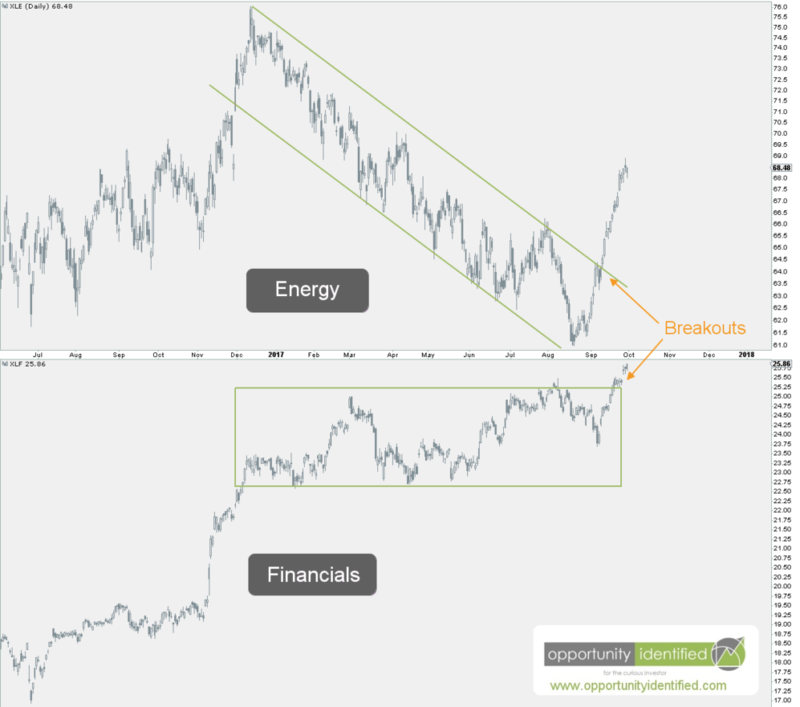 What is notable, however, is the recent breakout of Energy on an absolute and relative basis. We can clearly see buyers have changed the trajectory of price with XLE breaking out on an absolute basis and on a relative basis versus the S&P 500. This development is in conjunction with a divergence between price and momentum and buyers stepping in a logical support level near $63. In addition, price has recorded and higher low and higher high on this time frame. That’s the very definition of a trend change. As long as XLE can hold and sustain above $66.17, this countertrend move in energy will have legs. With an upside target near $70, this set-up has a friendly reward-to-risk ratio of almost 8-to-1. To conclude, while we’re not in the business of picking a bottom in Energy, it’s quite possible this recent move is something worth participating in. The game plan is simple. Above $66, own XLE. Below that, it can be someone else’s problem. Trade at your own risk. By the way, we created this free tool for you, The Ultimate ETF Cheat Sheet. It’s an easy-to-use ETF resource guide. We think you’ll like it. For our readers in the United States, we hope this update finds you refreshed after the long weekend and remembering those who gave their life to ensure their fellow countrymen remain free. The U.S. Markets were closed for this important observance, with trading resuming this morning. If you’re a regular reader of our work, you know it’s important to take a look at price, markets, and trends from different angles. Any edge we can gain in identifying opportunities is valuable. In this week’s post, we want to show you an important index you’ve probably never heard of that can provide valuable insights regarding the health of the U.S. stock market: the Value Line Geometric Index (XVG). This index tracks the median move of stocks within the index using the assumption that each stock has an equal amount (for example, $1,000) invested in them. The daily average move of this index is calculated geometrically (rather than arithmetically). I don’t want to bore you with the details, but if you need more info, you can read more about the methodology here, page 4. More simply put, this index eliminates an illusion created by weighted index components. Weighted stocks within an index can pull it higher even as the majority of the stocks within the index are not following along. For example, in a weighted index like the S&P 500, it’s possible for the top 100 weighted stocks to carry the index higher while the remaining 400 stocks lose value. As an investor, it might be helpful to identify when this is happening. 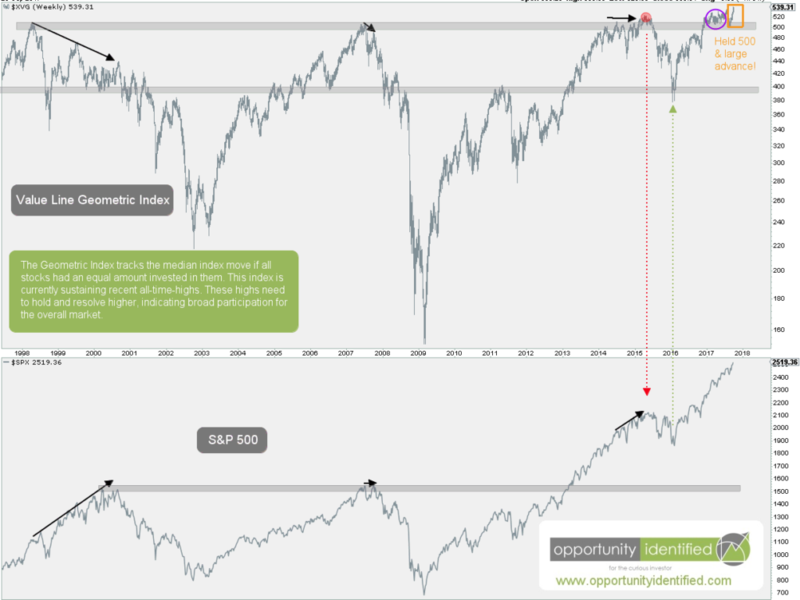 By looking at the Value Line Geometric Index alongside the S&P 500, we gain valuable insight into what is currently taking place in the market. 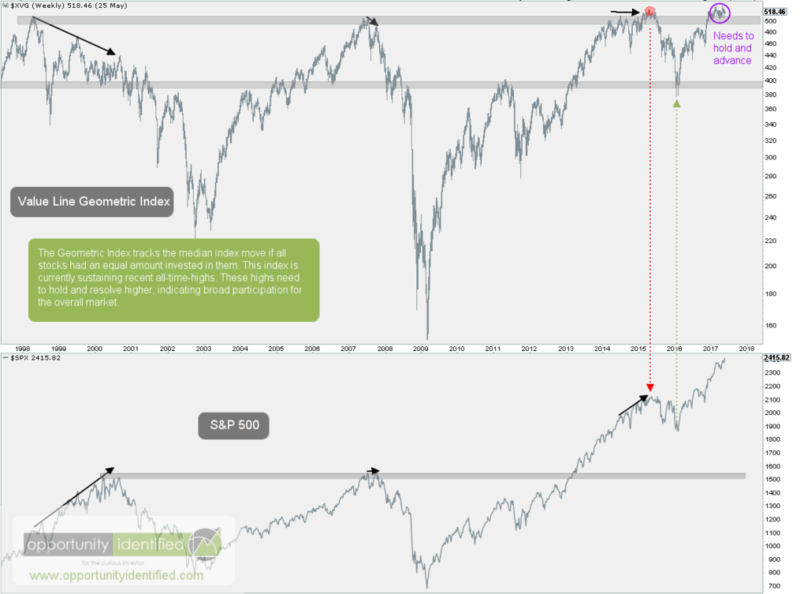 Looking at the chart below, the Value Line Geometric Index is in the upper panel and the S&P 500 in the lower. This chart shows while most stocks within the S&P 500 have been flat, it’s Technology pulling this major index higher. Many assume when the S&P 500 records new highs, it means everything under the surface is participating. This couldn’t be further from the truth. In fact, many sectors are currently underperforming the overall index. Because of tech’s large weighting (over 20%) in the S&P 500, it’s been carrying the water for other sectors currently struggling to gain traction for the past few months. While the condition persists, market participants will need to be diligent in their stock selection. In addition, we’ll want to watch for clues from the leading sector, Technology, on whether this current run can continue. It’s a positive when economic bellwethers like Apple (AAPL), Amazon (AMZN), Facebook (FB), Google (GOOGL), Nvidia (NVDA), Adobe (ADBE), Microsoft (MSFT), and Netflix (NFLX) can lead. At the same time, it would be healthy if more sectors start to participate. If and when laggards like Energy and Financials find demand, it could signal another strong leg higher for the overall market. But if Technology start to sell off and the Value Line Geometric Index fails to hold these recent highs, it likely means a decent correction will be underway. As always, we don’t need to predict to invest. Price is the only fact that matters. And as long as this condition is in place, we’ll be watching the price of the S&P 500 closely. You should be too. AND, you’ve got FREE access to a time-saving tool we’ve created, The Ultimate ETF Cheat Sheet. Click this link to get your FREE easy-to-use resource guide for all your ETF needs. At 360 Investment Research, we like to dig deep into the market and take a look at what sectors are leading the US market upward. By analyzing sectors on a relative basis against the S&P 500, we can gain insight into what sectors are leading the charge. This, in turn, may provide clues on where we are in the market/economic cycle. The theoretical market/economic cycle is a model based on the work of Sam Stovall in his book, S&P’s Guide to Sector Rotation. The basic premise is that different sectors are stronger at different points in the economic cycle. StockCharts.com has done a great job elaborating on this rotational cycle. The chart below is courtesy of StockCharts.com. It does a good job of visualizing these relationships and the order in which each sector should outperform in the context of the overall market. Moving from left to right, we see that Cyclicals (or Consumer Discretionary) and Technology lead the market out of bottoms. Industrials, Basic Materials, and Energy lead during a Bull Market. And Staples, Healthcare, Utilities, and Finance are the safe havens during Bear Markets. It’s not as clear cut as what I just wrote or what is visualized below, but it is a really great guide to the likely relative performance characteristics of each sector as the market progresses. Researching approximately how each sector is performing can be a good exercise in determining where we might be in the overall market cycle. Obviously, if we’re in a healthy Bull Market, we want to see Bull Market leaders like Technology, Industrials, Materials and Energy outperforming (or leading) the overall market. Conversely, we would be concerned about the overall prospects of the market and economy if we see that big money is moving into defensive sectors like Staples, Healthcare, and Utilities. So let’s dig in and see what sectors are leading the overall market. Of the ETFs above, those with strong relative strength and momentum in comparison to the S&P 500 appear in the green Leading quadrant. Those with relative momentum fading move into the yellow Weakening quadrant. If relative strength then fades, they move into the red Lagging quadrant. And when momentum starts to pick up again, they shift into the blue Improving quadrant. In the RRG below, the long tails represent the movement of each sector over the past 20 weeks in comparison to the S&P 500. So what do we see? We see that XLV, XLU, XLP, and XLF have moved from positions of weakness and laggards to positions of leadership. Health Care (XLV), Utilities (XLU), Staples (XLP), and Financials (XLF) – defensive sectors – are leading this market. On the other hand, Technology (XLK) is weakening while Energy (XLE), Materials (XLB), and Cyclicals (XLY) are lagging. Bluntly, defensive stocks are leading and those who we want to lead a Bull Market are lagging. Money is flowing into defensive sectors. This is not what a healthy and powerful Bull Market looks like. Does it mean that this the top of the Bull Market? No one knows that. But, enough money is flowing into defensive sectors that investors like you and me should take notice. Note: The terms “Relative Rotation Graph” and “RRG” are registered trademarks of RRG Research.